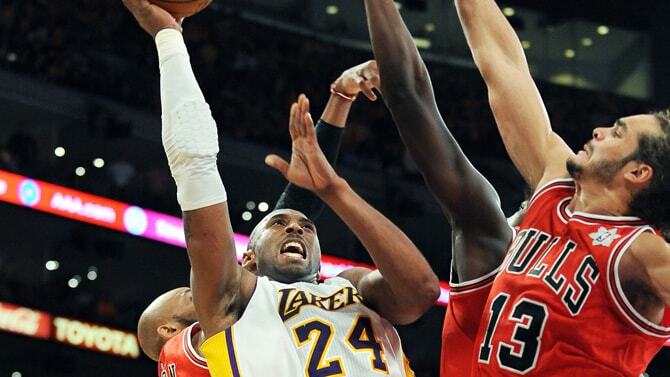 Are these the Bulls' top 10 games of 2014-15? Derrick Rose had a crossover move with a drive and switch hands lefty layup that should have been a painting hanging in a Louvre. He had a full court drive that had Usain Bolt thinking of withdrawing from competitive racing. He also missed a two-handed slam dunk with no one nearer than Sacramento Avenue and threw a jump pass off the back of the backboard that almost took down a drone. It’s USA Basketball and its quest for the gold medal in the FIBA World Cup of Basketball, which begins later this month in Spain and qualifies the winners for the 2016 Olympics. “I know that it’s basketball, but what’s going on here is bigger than basketball and bigger than one person trying to do something,” Rose said after the game. 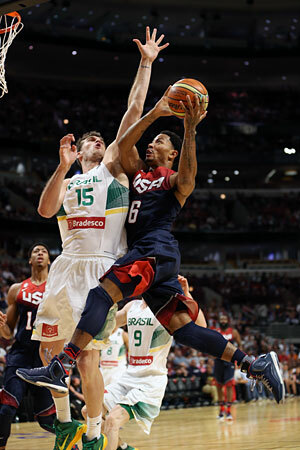 But Saturday at the United Center, the first exhibition game for the U.S. national team was the subordinate happening compared to Rose’s return to the basketball court. It was greeted wildly and enthusiastically by a huge crowd for an exhibition, which the USA team, by the way, won 95-78 by pulling away from a five-point game early in the fourth quarter. Fellow Chicagoan Anthony Davis from Perspectives Charter High School and the New Orleans Pelicans was the star of the game with 20 points, eight rebounds, five blocks, a full gainer dive into the stands for a loose ball and a half dozen followups and dunks that symbolized a USA effort of aggressive defense and offensive activity that will be their tournament game plan. But if Davis was the leading man on the court who stole the momentum away from the Brazilian team, it was Rose who stole the hearts of the partisan home crowd which opened the evening chanting “MVP” for Rose and closed two hours later urging coach Mike Krzyzewski to return to Rose to the game even though Rose had played the entire third quarter and would be third in minutes for the U.S. team. “I didn’t react to the crowd. I never would do that,” a lighthearted Krzyzewski said with a laugh. “I wanted to see if he could play beyond… One of the things about bringing a guy back, he needs to learn how to play tired. We wanted to see that and he did pretty good. 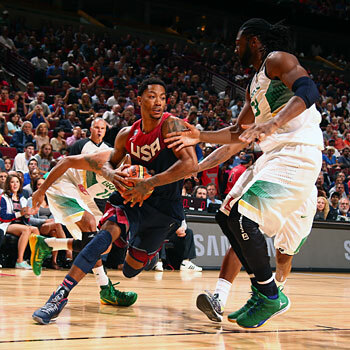 That play, a full court burst out of the blocks with 4.6 seconds left for a layup to close the first half and give the USA a 45-37 lead was one of Rose’s better offensive moments. He didn’t have all that many with seven points, four rebounds, three turnovers, two assists, a steal and a block. But he played easily and aggressively, and it was plenty for a rollicking United Center audience rising and falling in emotion even as Rose merely dribbled the ball. “I’m used to people cheering, so I didn’t let it get to me or anything like that. It was just me playing the way that I normally play,” said Rose. “That (positive fan response) was huge. I was surprised I didn’t get nervous up there (for a pregame address to the fans). Going to all these adidas events and appearances has helped me talk in front of people. Just being up there, actually just being in Chicago and bringing some life and some positivity to the city is huge for adidas and for USA Basketball. I want to thank Nike for giving us this event here in Chicago. Yeah. When I was out there, (I knew the fans) wanted me to shoot every ball. But I’m playing the way that I normally play in the tryouts, push the ball, play defense and get guys shots. When a shot is available, take the shot. I think that’s what I did tonight. I had one or two turnovers but that can be easily changed. It obviously was positive for USA Basketball in seeing its aggressive style working against a good Brazil team with three quality NBA big men, Nene, Tiago Splitter and Anderson Varejao. If there’s a weakness for this relatively inexperienced USA team it is size. But the team showed with pressuring defense, activity and timely if not great shooting it could overcome the size disadvantage. Davis was impressive. James Harden added 18 points, and though he tends to hold the ball too much, he gets to the basket with aggressive drives and was 10 of 10 from the free throw line. The USA team started Rose, Harden, Davis, Kenneth Faried and Stephen Curry, which looks like their starting team for the tournament. Faried had tremendous activity to offset the size disadvantage. Mason Plumlee off the bench also displayed that sort of activity and is the kind of big man Krzyzewski seems to want for this team, quick and athletic. Curry, as usual, shot the ball impressively early and backcourt mate Klay Thompson defended heartily. The USA team will play two exhibitions in New York next week and then likely make some cuts before leaving for Spain. Though it was an especially positive night for Rose even beyond yet another basketball comeback, looking physically well if not fully basketball ready. Rose also continued to find his voice as not only a leader on the court but in the community as he again took up the cause of wanton violence in Chicago in pregame welcoming remarks, emphasizing to the fans the wanton loss of life that’s bigger than any of the basketball and must be challenged. 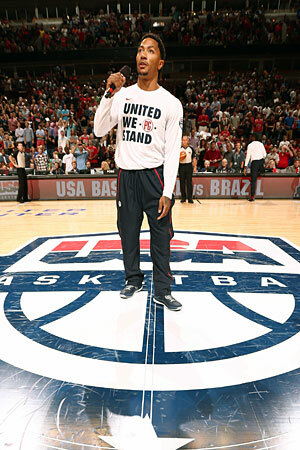 Rose and the USA team do not have time, either, with a furious schedule of games in the next month. But Rose says he is ready, and his coach, Thibodeau, was passionate in his excitement for Rose. “This is the perfect setting for him,” enthused Thibodeau. “I thought his first (USA team) experience in 2010 was the springboard to his MVP season. All summer long he’s gotten more comfortable. He went through the comeback last year and I think he learned a lot from it. I love the way he’s playing. He’s finding the rhythm of game and playing to his strengths and recognizing who’s on the floor with him and what their strengths are. He made several good plays, particularly against the zone in the fourth quarter. He’s shaking some rust off, but his explosiveness is back. He’s playing well on both sides of the ball. I think he’s in a really good place. It’s unfortunate what he’s gone through. But I think that adversity has made him a lot stronger. It was really seeds of growth for him. I love where he is mentally and physically right now. It also appears to be a warm and embracing experience for Thibodeau with the tested Krzyzewski. Thibodeau, who is generally a bundle of raw nerves and energy on the bench, sat serenely during the game, or, at least, what passes for placid for him. And afterward as they had a joint media conference, Krzyzewski jabbed Thibodeau a bit when Krzyzewski was asked about starting Davis. It’s one thing to lead USA teams to three gold medals. But Krzyzewski has Thibodeau laughing and accepting mocking praise. Now that’s coaching. It was an effort for the USA team worth plenty of praise with a fast start for a 29-15 lead after one quarter, reduced to 35-33 late in the second quarter and 45-37 at halftime after Rose’s darting drive. The USA team was squeezed again in the third, leading 68-63 after three. They are aggressive defending the perimeter and using Thibodeau’s defense in driving the pick and roll to the baseline. But the weak side help, which takes time, was often late and led to several easy scores for the Brazil big men, something the USA team will try to remedy. But they broke it open to start the fourth with a Thompson three Krzyzewski called the game’s biggest shot and then a flurry of spectacular plays from Davis with a block leading to a three-on-one break, a lob slam dunk on a pass from Kyrie Irving and Davis’ own 20 footer and a put back that shot the USA team ahead 87-68 midway through the fourth quarter as they eased to the win. Earlier in the first half, Rose had a steal and then missed an open two-handed slam dunk, just as he did during one of the Chicago training sessions, though the leaping was there. The expectant crowd was ready to deliver for Rose with that one. But he didn’t disappoint later in the third quarter when he crossed over his defender on the left wing and then blew into the lane and finished left handed with a layup score that sent the United Center spectators into spasms of delight. There were two bigs converging, which was why Rose had to change hands to finish. But yet another positive sign of Rose returning to his previous levels is he didn’t even think they’d be problems. And it’s a much better game with Derrick Rose back playing it like this. The fun apparently is just beginning. Rose: "I probably won't get any sleep tonight. I'm excited for the city. This is huge for us." Thibodeau on Rose: "He's shaking some rust off but his explosiveness is back and he's playing really well on both sides of the ball."